Money - You donate cash to Pack 29, we're a non-profit and take the deduction on your tax return. Equipment - Do you have camping equipment or something related that you want to go to a good cause. Give it to us! Email the Cubmaster or fill out the contact form. Time - You want to help us with a campout, whittling class, camping instructions, help organize a Pack meeting or something similiar. If you have some knowledge of kids, outdoor activities or scouting that we'd like to have you. Contact the Cubmaster to volunteer your time. 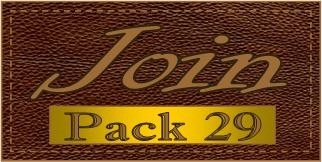 Pack29Store - coming soon (samplestore). You buy from our store that's just like Amazon and we get a little donation from Amazon. Don't worry, the prices are not higher that other places. 1000's of items on their way. Amazon - Use any of these buttons shop at Amazon and our Pack will receive 6-10% of most products you buy! The prices aren't inflated, so you get what you want and help your local Cub Scout Pack.